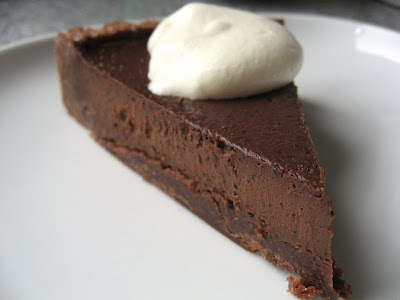 A very rich, decadent tart with the full flavors of strong coffee and bittersweet chocolate cut with a salty sweet chantilly. But seriously, this was rich - it has cream, condensed milk, evaporated milk and bittersweet chocolate - not a tart for the weak of heart! 1. In a food processor place all the ingredients except the egg. Pulse them together until the mixture looks like fine breadcrumbs. 2. With the machine running add the egg, and process until the dough comes together. You may need to take it out and knead it for a short period to integrate the ingredients. 3. 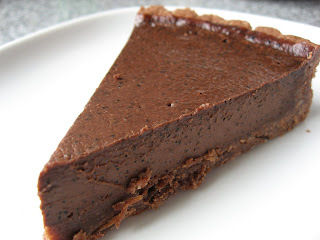 Press the tart base into a greased tart pan and freeze overnight. 4. Preheat the oven to 325F. 5. Line the frozen base with parchment paper and place pie weights or dried bean inside of it. 6. Bake for 15 min. Remove the weights and paper and bake until the base is dry to the tough (this took around 10 min for me, but check after 5 min). 7. Let the base cool completely on a wire rack. 8. Turn down the oven to 275F. 1. Place the chopped bittersweet chocolate in a large mixing bowl. 2. In a medium sized saucepan add the cream, evaporated milk, coffee and salt. 3. Stir over low heat until the mixture begins to simmer. 4. Strain the mixture through a fine sieve into the bowl with the chocolate and whisk until there are no more lumps and the mixture is shiny. 6. Whisk in the condensed milk, making sure that all the ingredients are well integrated. 7. Pour into the cool tart shell. 8. Place in the oven. Bake for 10 min and then rotate the pan for even baking and bake another 10 min. The book states that 20 min all up should do it, but I needed another 20 min on top of that. The idea is that the tart be a little jiggly but not wet, so keep that in mind and adjust the time accordingly. 9. Remove from oven and cool on a wire rack. Unmold before serving. 1. Whisk the cream until soft peaks form. 2. Add the sweetened condensed milk and salt. 3. Whisk until medium soft peaks form. Taken from the beautiful "The Sweet Spot: Asian-Inspired Desserts" by Pichet Ong and Genevieve Ko pp. 25, 138-40. Oh, my goodness. That looks absolutely amazing. That looks incredible! I'm so in my chocolate zone. If I only had a piece. Delicious! Wish I could have a bite! that looks eeevil. i *love* bittersweet chocolate and coffee together - the deeper and darker, the better. Wow! This looks fabulous! So decadent. I can almost taste it! A scrumptious looking tart! I'm drooling!